This painted cardboard assemblage (3D collage), inspired by the work of Louise Nevelson, can be completed by one individual artist working over time, or by a classroom or play group working together. While this project may take more prep. time, the finished product is magnificent! An assortment of recycled/found cardboard objects, such as paper towel rolls, toilet paper rolls, small boxes, packing inserts,egg cartons, to-go beverage holders, etc. Gather your cardboard objects, such as paper towel rolls and packing inserts. It may take time to gather a large assortment so plan accordingly. When I led this project at my son’s school, we asked parents to bring in objects and collected the materials over a few weeks. If you are planning this project individually at home, consider saving objects from your recycling, anything that is cardboard is fair game. Gather your boxes. I’ve found that heavy duty boxes such as diaper boxes and shipping boxes (think Amazon or USPS) work best. Look for a variety of sizes and shapes if possible. Once you have all your boxes you will need to cut them down to create a tray-shape. I used an exacto knife to cut away the top 3/4 of the box, leaving a 2-3 inch high frame around the bottom of the box. If you are careful, you can get two “trays” from each box (the top and bottom). In the image above, you can see the way we trimmed a priority mail USPS box and a diaper box. Look for the postal symbol and the word “overnight” on the sides of the boxes to get a visual idea of where to cut. Now it’s time for your little artist(s) to get to work! Look through your found and recycled cardboard shapes together. Begin arranging them in your box-trays. The youngest artists (18 months) may simply choose objects and throw them into the tray, but more mature pre-schoolers may use this step for imaginative and inventive play. For example, children at my son’s school pretended to build “rocket ships” and “cities.” See images above. Glue! You will need A LOT of glue for this project. I recommend starting with a heavy layer of glue in the bottom of the box-tray so that the littlest artist can simply lay their objects down. Preschoolers will love using their own glue bottles to make sure all the objects are secure. After you have filled all your box-trays with cardboard objects, you will need to wait at least a day, if not a few days, before painting. Over the drying days, check the objects to make sure they are sticking together, add more glue if needed. When everything is dry and securely glued together it will be time to paint. Your little artist will paint all the shapes and objects in the box-trays one color. Louise Nevelson used black, white, or gold for her sculptures. We used black paint because it covered the printed areas on our objects best. Encourage your little artist(s) to cover every single blank space with paint. Help them look for areas that need paint inside of tubes and under objects. When we did this project at my son’s school the older students (4 years old) painted their own sculptures and then “helped” the youngest students (18 months) by painting any of the blank spots the little ones had missed. After the sculptures have been painted and have had time to dry, it will be time to arrange your box trays and hang them on the wall together. I recommend laying them on the floor first and trying different arrangements. When you have decided on an arrangement, install your sculpture on the wall. I used one small nail per box-tray, making sure each was nailed securely to the box-tray next to it. The final product is pictured below. You can see how tubes that were glued standing up in the box-trays project forward when the sculpture is installed on the wall. This completed sculpture was created by 48 little artists, age 18 months to 6 years old. It is shown here installed on the wall of the school. It is a good idea to sort and cut your cardboard objects in advance. For example, I cut many toilet paper rolls to create many more small circles (see the image top-right). I also cut apart cardboard egg cartons and to-go drink holders to create interesting shapes. This step helps guarantee that your little artist will have a variety of interesting shapes to play with and arrange. When helping your little artist to arrange shapes, encourage them to try placing shapes in the boxes many different ways. For example, you can lay a paper towel tube flat in the bottom of the box, stand it up straight, or lay it diagonally on top of other shapes. You may also want to help them build layers of shapes that project high above the border of the box. 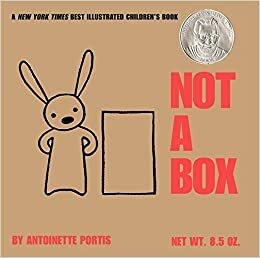 Before or after your collaborative wall sculpture project, read the book Not A Box by Antoinette Portis together with your little artist. Previous Post What is Play Free and Create?